For the third month in a row, I challenged myself to scrap using all of the new PageMaps sketches that were posted September 1. I find that using the sketches saves me a lot of planning time and it's a fun way to knock out ten new layouts. I had these photos of Tom helping my sister tattoo identification numbers inside her Highland cattle's years on Easter. I had printed them into a 5x7 collage, but cut them apart to use with an 8.5"x11" sketch. 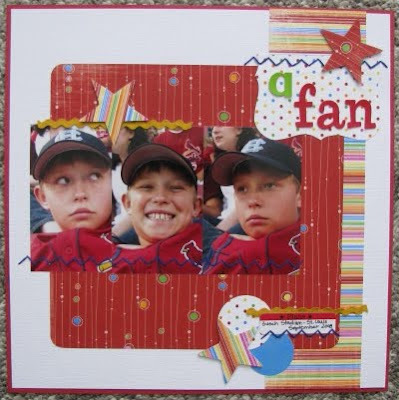 I used my June Personal Scrapper kit and love how the colors of the papers/embellishments worked with the photos. One sketch called for six 4x6 prints, but I adjusted it to use with my four 5x7 prints/collages. Again, I used my June PS kit. I used pop dots behind the cut out stars. I loved mixing the crazy Doodlebug alphas with Thickers for my title. The foam Thicker font I wanted to use for "museum" almost didn't fit, so I scrunched the "m"s a bit. I like how they look though. While I had the June PS kit out, I realized a couple papers would work well with this shot of Blake that I was having a time matching up with anything. (Although according to Addie, EVERYTHING goes with camo!) I altered my sketch just a bit so I could sew in a pocket for the Governor's Cup Program. Blake had done well enough to advance to Regions and we were super excited the morning that I snapped this shot. I really liked my July Personal Scrapper kit, but this floral patterned paper wasn't a favorite of mine. I noticed it matched out first day of school pics from two years ago, so I pulled it out to use. The story here is more about our tradition of posing before the bus comes on the first day, so the title is "posers." 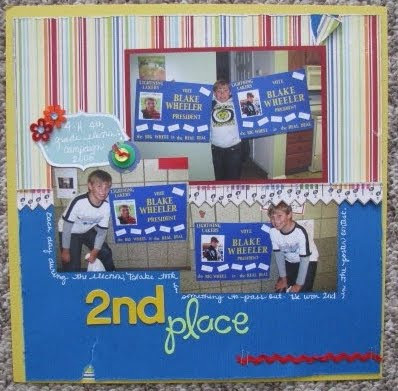 My "2nd Place" layout is the result of a few happy accidents. I followed the sketch pretty closely, but when I was finished, something was missing. I decided to cut the LO down a bit and mat it on yellow cardstock to create a frame. Before adhering it to the yellow, I used my edge scraper, but accidentally tore into my layout in a couple places. Since the striped paer was already backed by the blue that was my original base, I added some stripe behind the blue that I tore. To keep with the "rough" feel of the LO, I adhered it crookedly to the yellow. A little background story...Last year Blake ran for 4-H President. He didn't win, but he won 2nd place in the poster contest. 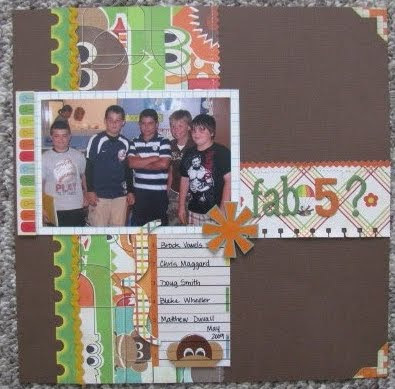 I used my July Personal Scrapper kit for this page. When I made "a fan" I did something I never thought I would do. I took a 2-page sketch and condensed it down to a one-page layout. It's more common for me to take a single page sketch and stretch it into a 2-pager! The sketch for this was actually a 2-page 8.5"x11" LO. 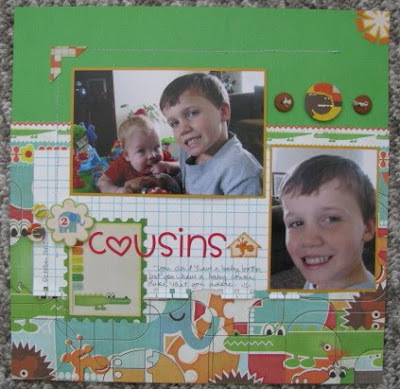 I made it into a 12x12 since I needed to crop my photos down. The important thing was Blake's expression and not the crowd around him at the ballgame. I used Bo Bunny scraps for this page. Again, I felt the need to "frame" my LO with another color of cardstock. I decided to use handstitching and sub stars for the flowers on the sketch. 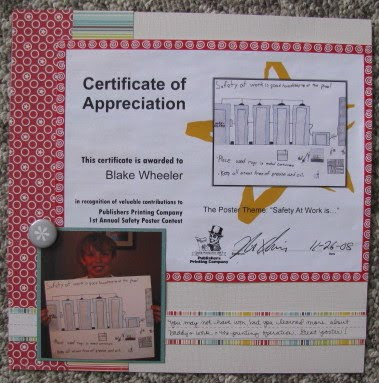 I took another 2-page sketch (the one with the circle photo on the left-hand page) and used only the right hand side to scrap this certificate and photo for Blake. Every so often I have something like this to scrap and I usually find it hard to make it "pretty." Since the sketch called for an enlargement, I just subbed in the certificate and flipped the sketch. 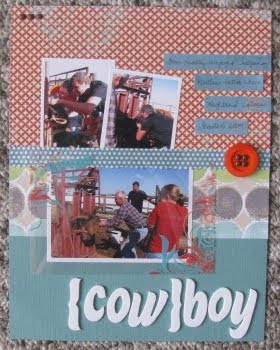 I used my brand new September Personal Scrapper kit that arrived yesterday. I've been wanting to scrap "don't scrap that" since I took the picture a few weeks ago. The boys had gotten into a fight in the backyard and Kevin stomped to the back garage door crying. Scout ran over to comfort him which was so cute I had to run in to grab my camera. Just as I snapped the shot, Kevin yelled, "Don't scrap that!" 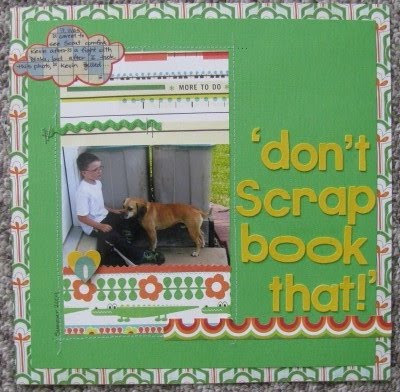 Doesn't he know you don't tell a scrapbooker that! I had fun using some Sassafrass Lass papers, here. I used my large title in place of the flowers on the sketch. "Fab 5?" took an 8.5"x11" sketch and turned it into a 12x12. I loved these Sassafrass Lass papers, but had them sitting around. When I came across this photo of these 5 wild and crazy guys, I knew I had to use them. I stuck pretty close to the sketch on this one. I LOVED the sketch I used for "2 cousins" but decided to alter it to use with these two photos I had out on my desk already. (The sketch called for 4 photos.) 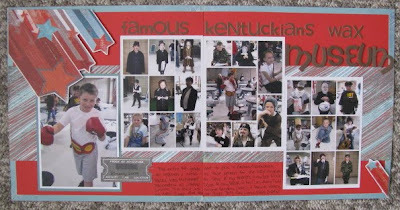 I added some embellishments and repositioned my title to fill in the space that called for the other photos. I just think this is a really fun page with the photos, colors, and Sassafrass Lass papers . You are on a roll! Awesome layouts! I'll be doing some layouts soon that include camo! And I have some camo sb paper! wow! You are amazing Amy! Good job! What great layouts! This is just insanely wonderful, Amy! Four months in a row -- good for you -- and GREAT layouts!